Step 1: Paint the wooden frame a solid color. White works well for this, or any other color is fine too. If your child is old enough, he or she can do this step independently. If you have very small children, you may want to do this step ahead of time. Let it dry completely before moving on. 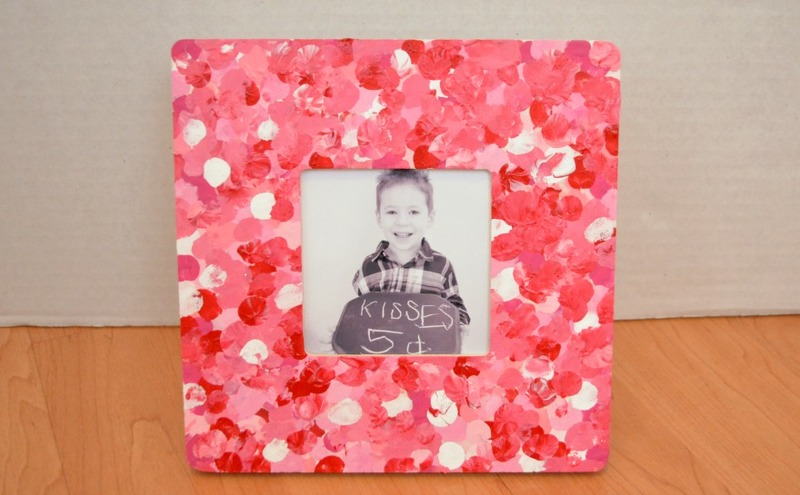 Step 2: Have child “paint” the frame using his/her fingertips dipped in paint to create dots. I like to squeeze the paint onto a paper plate then let my son work one color at a time. Have the child dip his/her finger into a color and “dot” it onto the frame. Then, change colors and fill in the empty spaces. Continue doing this until the entire surface of the frame is covered. Step 3: Add a photo! Once the frame is completely dry, add a favorite picture of the child or maybe even the child with the recipient of the gift. These are so inexpensive to make and kids love having the opportunity to paint with their fingers. This project is easy to adapt for children of different ages; younger kids can simply cover the frame with dots, while older kids can come up with their own intricate patterns and designs. Two fingerprints crossed over one another make a cute heart shape, so you could cover the frame in fingerprint hearts too! The possibilities are endless…it’s all up to each child’s imagination! And trust me, grandparents love to receive “made with love” gifts like this one. Who in your family would enjoy receiving a frame like this for Valentine’s Day?